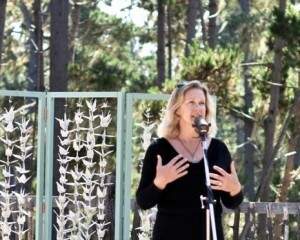 Zette Harbour is the founder and Artistic Director of the Peace Love Story Fest, the only storytelling and music festival of its kind on the Central Coast of California. It felt like we had gone back in time and experienced something so rare in today’s world. We bring professional storytellers & musicians to the stage to entertain & inspire. All ages flock to the festival & there’s something for everyone. The festival blends diversity with universality. The 2nd Annual Peace Love Story Fest was held on October 19 & 20 of 2013 in Los Osos, California. The theme was Transforming Community. In partnership with Grisel Puig-Snider, herbalist and mujer sabia de la comunidad, the focus of this festival was to build community through storytelling. 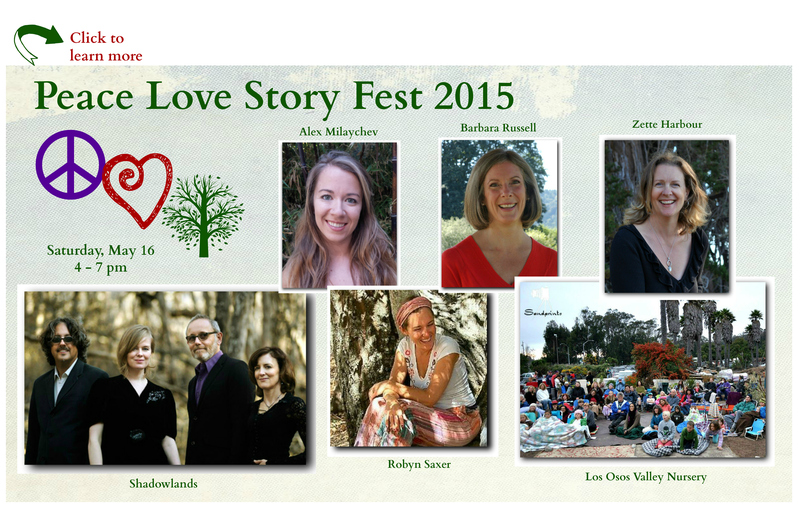 The festival was hosted by Los Osos Valley Nursery and the South Bay Community Center. 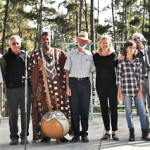 This year’s storytelling festival featured Baba the Storyteller and Zette Harbour, along with Ranchers For Peace and Dylan Nicholson. Hope Merkle of Los Osos Valley Nursery hosted a special family marshmallow roast after the performance in the Oso Oven. Story Swaps & workshops throughout the day offer ample opportunity for everyone to share their stories, to truly speak from the heart, & to play in our workshops. 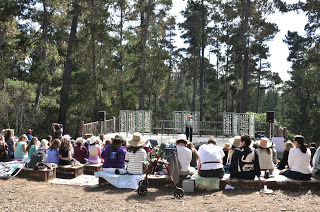 The Story of Tea workshop led by herbalist, Grisel Puig-Snider. The Art of Storytelling workshop led by Baba the Storyteller. More than being in this community, you are invited to BE this community. 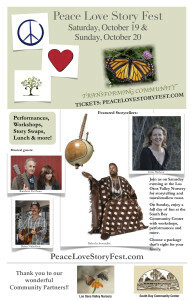 Within the gracious beauty of Camp Ocean Pines, Cambria, the 1st Annual Peace Love Story Fest was held on September 16, 2012. 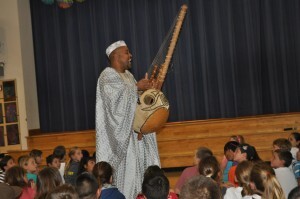 Featured performers were Baba the Storyteller, Zette Harbour, Ranchers For Peace, and Shannon Savage. 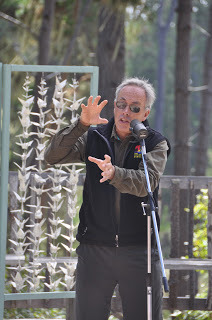 Local favorite, Guy Rathbun was our emcee and camp director, Chris Cameron inspired listeners with his original tales. 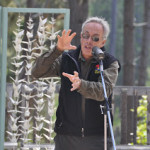 The community-created 1,000 Crane Peace Sculpture was revealed for the first time in public and held the story space onstage. Over 200 community volunteers, led by Zette Harbour, folded the custom-designed origami cranes symbolizing their individual wishes for peace. Following the festival, the sculpture was displayed at a number of local schools in honor of the International Day of Peace. The title says “How to”, but the truth is, I’m just about to begin to learn. 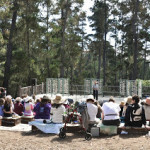 I’ve been invited to hold a storytelling festival at a beautiful camp in Cambria, California – Camp Ocean Pines. It’s called the Peace Love Story Fest and the idea for the theme came about when I was in New York City with my daughter at the Montessori Model United Nations Conference in April. I was watching the students caucus about the issue of the status of the Israeli/Palestinian heritage sites. One after another, the recommendations for a resolution offered the idea that the sites should be owned by the UN, kept neutral, or managed by UNESCO. It was then that I realized that there was something missing in these ideas. How do you shift the Israeli’s and the Palestinian’s stories in order to allow for the neutrality of these sites? Each side believes that it must preserve the sacredness according to it’s own religious dictates. Only a new story, a story in which the respective deities desire and require the two sides to work peacefully together would create a peaceful resolution. 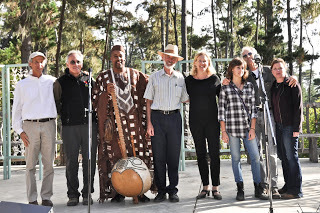 That’s when I realized that a storytelling festival could be the beginning point from which awareness, dialogue and then, action toward creating real peace would be launched. The timing was good. Our date was already set at the weekend of September 15 – 16. 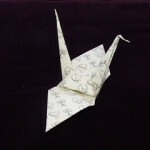 One week before the UN’s International Day of Peace on September 21. 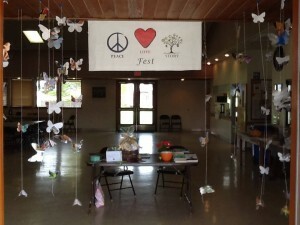 I decided the festival would be the kickoff of a week of Peace Awareness. 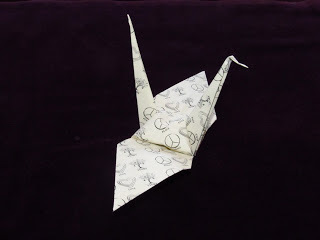 A 1,000 Crane Peace Sculpture would be unveiled at the PLS Fest, and then displayed at other locations during the week, culminating on the 21st. My goal is to get people talking, listening, and then acting. I did some research and learned about Peace One Day, an organization started by Jeremy Gilley. miles to go before I sleep…….